INFINITE finished their part in “2012 Summer Sonic” very successfully. 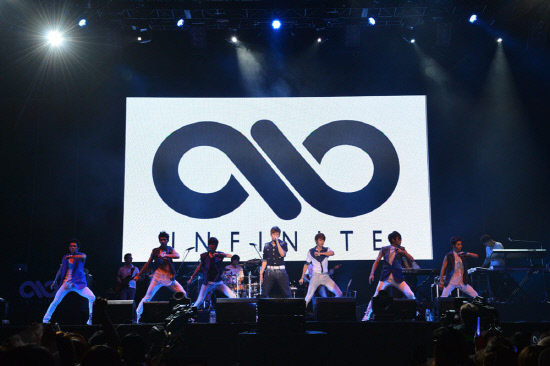 INFINTE was invited to represent K-Pop artists of this year at “2012 Summer Sonic” which is one of the biggest music festivals in Asia that open in Japan. Artists like Green Day, Rihanna and Jamiroquai all attended this year’s “Summer Sonic” and amongst these internationally famous artists, INFINTE pulled their weight with a powerful performance characterized by their precise military-style dances. INFINITE’s third single “She’s Back” will be released on August 29 in Japan and when they revealed their Japanese version live at the performance, the fans erupted in cheers and showed how much popularity the boy band is currently gaining. We reperoted a few weeks ago that boy group INFINITE will be releasing a 3D movie of their ‘Second Invasion‘ concert, which took place on April 1st this year. 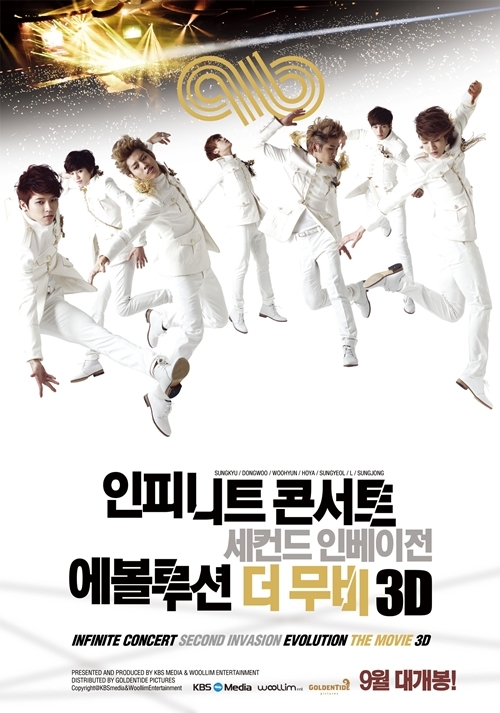 It has been announced that the movie, ‘INFINITE Concert Second Invasion Evolution The Movie 3D‘, will open in theaters on September 6th! The 3D movie will feature the ‘Second Invasion’ encore concert, filmed with over 30 cameras to help complete the project. The encore concert was opened in April due to the success of INFINITE’s original concert, held this past February, which sold out in just 10 minutes. INFINITE’s concert “INFINITE Concert ‘That Summer'” kicked off on August 8 at the Seoul Ax Hall. Unlike their concert 4 months ago at the Olympic Gymnasium in Seoul sat over 10,000 people in the audience, the members of INFINITE performed in front of a crowd of 2,000. The concert was held in a much smaller event hall compared to the Olympic Gymnasium which meant that the members of INFINITE could perform much close to their fans. Each member of INFINITE spent 100 intimate minutes with fans that gathered to see them from all over the world. INFINITE will embark on its second arena tour this month with some 60,000 fans in total. The poster was revealed on July 16 through Woollim Entertainment, showing the seven members of Infinite dressed up in neat formal suits, looking dashing in front of the brightly lit mirrors in a waiting room. 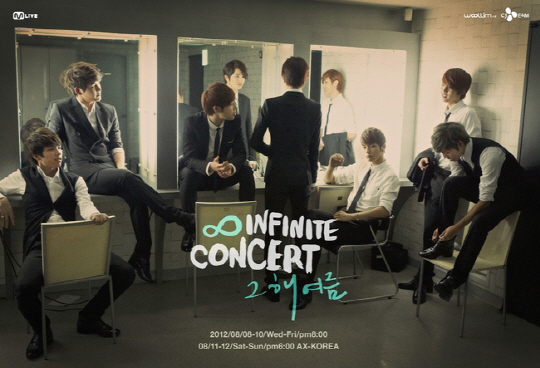 INFINITE showed off their ever growing popularity as the tickets for their upcoming concert have sold out. 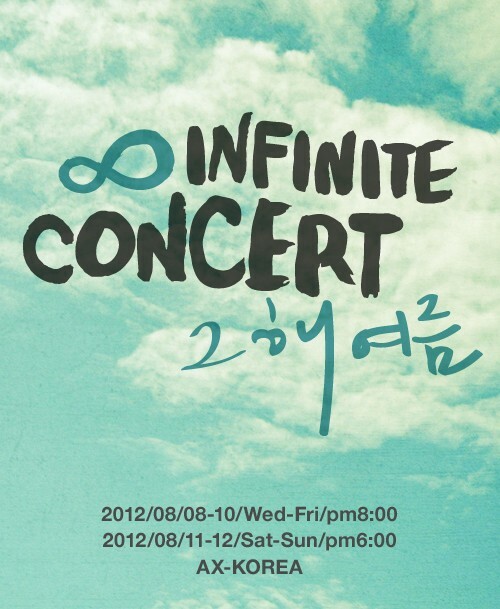 INFINITE has started selling tickets for their upcoming 5 day concert ‘That Summer’ on the 8th. Having sold out their previous concerts immediately, it came as no surprise as servers become overloaded with fans trying to get a hold of a ticket for the upcoming concerts. Within 15 minutes, a total of 10,000 tickets for all five days of the concert were sold out and the unlucky ones have been calling in to ask for more. INFINITE Releases Poster for ‘That Summer’ Concert! 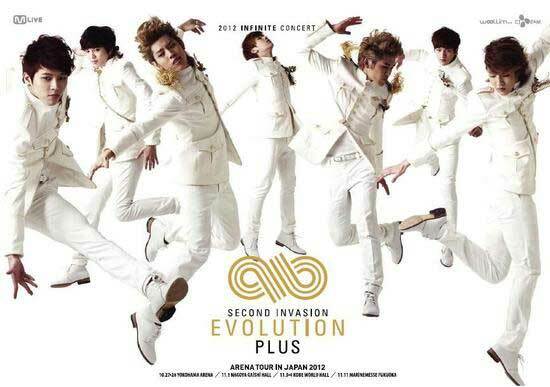 INFINITE released their poster for their concert. On July 12, INFINITE posted an image of their concert “That Summer,” showing off the member’s playful looks. 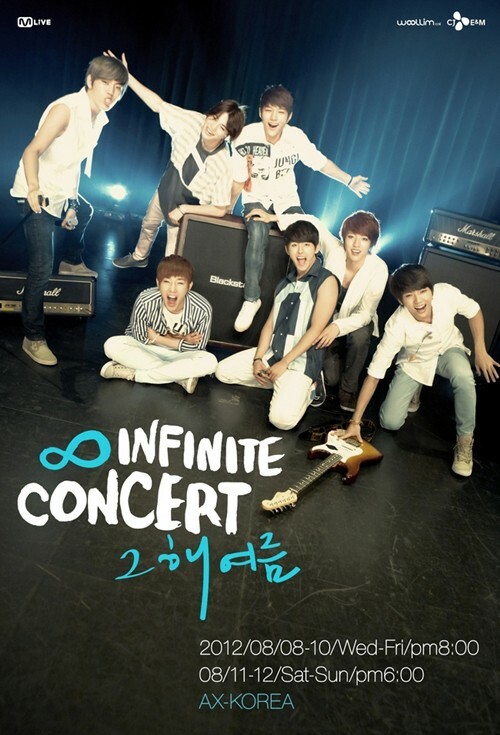 In the poster, the members are sitting on top of speaker amps and playing with the guitar. This image showed off a different side to their usual charismatic and powerful performances on stage. 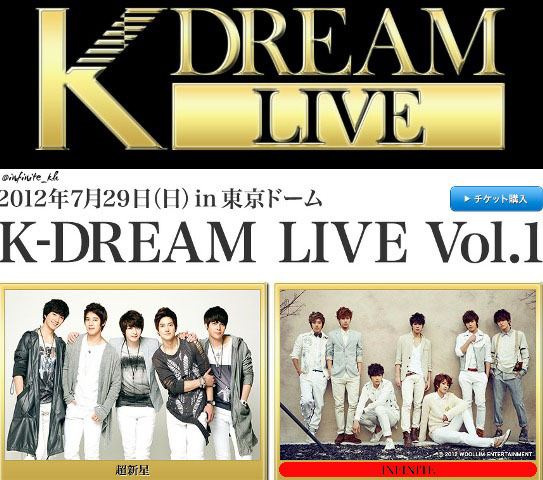 Idol group INFINITE will be performing at the Japan Tokyo Dome stage. With 2000 seats per hall, they plan on performing in front of a total of 10,000 fans. They chose a smaller venue in order to be closer to their fans. INFINITE plans on putting a fresh twist to their dance by performing an unplugged version. ‘2012 SBS K-POP Festival in LA’ to be Postponed to August? SBS was supposed hold an idol group concert in LA on July 6. However, the official SBS facebook and twitter accounts were deactivated the same week of their announcement.